Water, a precious resource for all living organisms has become a diminishing source in the present world. Reuse of water is a way of combating the scarcity of water. The remedy for the polluted water through eco-friendly approaches is a major challenging task for the researchers. Nanotechnology is expected to provide a better solution than the existing methods. Graphene, a novel carbonaceous material widely used in the field of nanotechnology is a promising substance in the treatment of polluted water. The present work deals with the bio-reduction of graphene oxide using the aqueous extract of Amaranthus polygonoides. The synthesized graphene was embedded with silver nanoparticles and Moringa oleifera pulverized seed powder. This modified graphene was used as adsorbent for simulated textile, tannery and paper mill effluents. The adsorption efficacy of graphene and modified graphene was compared with that of a commonly available adsorbent activated charcoal by analysing the water quality parameters before and after treatment. The results revealed that the graphene loaded with the silver nanoparticles and M. oleifera seed powder possessed excellent adsorbent properties and showed good efficacy on reusability compared to conventional activated charcoal. Water is one of the life-sustaining natural resources of billions of people and plays an important role in agriculture, ecosystem and health impacts around the world. From 2002 to 2008 the ground water of 109 billion cubic metres has diminished in the Indian states of Punjab, Rajasthan and Haryana (Rodell et al. 2009). The surface water systems are also threatened directly by the anthropogenic contaminants produced by various industries. This scenario has put the part of the world under the history of shortage of water, which serve sculpt for the water pollution. Developed nations have invested more in water technology, but the developing and undeveloped nations are at risk (Vorosmarty et al. 2010). Central and Northeast Asian countries experience more industrial pollution levels as indicated by BOD values than Southeast Asian countries (Evans et al. 2012). Water gets polluted by waste water produced by various industries like textile, dyeing, paper, distillery, dairy, oil and refineries. The anthropogenic contaminants from the aforesaid industries can be classified as effluent discharge, solid wastes and other hazardous wastes (Lokhande et al. 2011). In India, most of the industries functions under the guidelines of the Central Pollution Control Board (CPCB) but, still the environmental circumstances are unacceptable (Rajaram and Das 2008; Khurshid et al. 1998; Pachpande and Ingle 2004; Prabha and Selvapathy 1997; Singare et al. 2010). In 1999 more than 50,000 people lost their lives due to the consumption of polluted water (Nevondo and Cloete 1999). Even after progressive technological development, WHO reports in 2005 reveal 4 billion cases of diarrhoeal diseases causing death up to 1.5 million children due to polluted water (WHO 2004). The Ministry of Environment and Forests, Government of India marks textile industries under the category of the most polluting industries (Singh et al. 2005; Vinodkumar et al. 2012). It generates enormous amount of waste water through different processes like sizing, bleaching, mercerizing, dyeing and printing (Sharma et al. 2013). Textile effluents are characterized by high pH, BOD, COD, chloride, suspended solids, heavy metals (Cd, Cr, Cu, Hg, Ni, Pb, Zn, etc. ), dyes, organic, inorganic compounds, etc. that gradually contribute to environmental demolition (Egborge 1991; Emongor et al. 2005; Federal Environmental Protection Agency [FEPA] 1991). Research for more reliable and cheaper methods to purify the polluted water at an affordable cost is thus on an increase. Popular methods for the treatment of polluted water include physical methods (screening, comminution, flow equalization, sedimentation, filtration), chemical methods (chemical precipitation, adsorption, disinfection, dechlorination) and biological methods (trickling filters, activated sludge process, anaerobic digestion, aerated lagoon, rotating biological contactors, pond stabilization, biological nutrient removal, etc.) (Gupta 2011; Singh et al. 2011). The aforesaid methods are tedious, expensive and most of the time involves complex processes. Several studies on the treatment of effluent using microorganisms are also reported. Bacillus endophyticus VITABR13, a strain isolated from textile effluent decolourises azo dye (Prasad and Rao 2011). Selvam et al. 2012 examined the removal of colour by Trametes versicolor using dye industry effluent. The dyes present in the textile effluent are reported to be decolourised by white-rot fungi (Selvam and Priya 2012). Low-cost activated carbon adsorbent prepared by biological means such as waste biomass sources (Moyo and Chikazaza 2013; Sugumaran et al. 2012; Alam et al. 2007), coconut shells (Cobb et al. 2012), Mimusops elengi (Renugadevi et al. 2011), cotton stalk (Lia et al. 2011), soya bean (Murayama et al. 2010), coconut husk (Ramakrishnan and Namasivayam 2009), Tamarind wood (Acharya et al. 2009), asphalt, heavy oil fly ash and coal fly ash (Uddin et al. 2007), cattle manure compost (Qian et al. 2007), chicken manure (Koutcheiko et al. 2007), Euphorbia rigida (Gerçel et al. 2007), coirpith (Ash et al. 2006), peanut, pecan and walnut shells (Ahmedna et al. 2004), Parthenium waste (Kadirvelu et al. 2002) and bagasse fly ash (Kumar et al. 2008) have been reported to treat industrial effluents. Treatment plants (reverse osmosis) are established to reuse the treated effluent and to obtain zero liquid discharge (Rajamanickam and Nagan 2010). Carbonaceous materials like activated carbon have proved to be an effective sorbent for the removal of metal ions, their complexes and other chemical species. In 2010, the Madras High Court declared the Noyyal river unfit for human consumption as per the reports of National Environmental Engineering Research Institute (NEERI). In India, one-fifth of the exports are from the textile industries in Coimbatore and Tirupur areas. The untreated sewage and industrial effluents containing bleaching liquids, soda ash, sulphuric acid, hydrochloric acid, sodium peroxide, chemicals and various dyes are drain into the Noyyal River (The Hindu, 16th January 2012). Recently, Water Resource Organisation (WRO) of the Public Works Department laboured to rejuvenate the Noyyal system at Rs. 180 crores aided by World Bank in 2013 (The Hindu, 15th August 2013). All these necessitate the treatment of industrial effluents. Nanographene, a newfangled carbon material has received significant attention in recent years, due to its excellent properties like high current density, good electrical conductivity, ballistic transport, large theoretical specific surface area, super hydrophobicity at the nanometre scale, chemical inertness, optical transmittance, high thermal conductivity, etc. (Firdhouse and Lalitha 2013, 2014). Carbon derived from biomass is considered to be environmentally friendly and widely used on a large scale (Wu and Zhang 2012; Huang et al. 2011; Sindhu et al. 2012). The carbonaceous materials were fused with several metal ions under high temperature treatment to achieve special chemical and physical properties for use as adsorbents in water treatment (Asasian et al. 2012; Nagashanmugam and Srinivasan 2011). High porosity and very high surface areas were obtained by preparing such carbonaceous materials in high temperature environment which can enhance adsorption capacity (Zouboulis and Matis 1997; Zaini et al. 2010). The potential advantages of graphite over the reverse osmosis membranes are thicker (single to few layers), requires low pressure, water transport will be faster due to its high mechanical strength and large surface area. Cohen-Tanugi and Grossman (2012) reported that the nanoporous graphene membranes possess the ability to reject salt ions at higher permeabilities than the existing RO membranes. The removal of Ni (II) ions was achieved using graphene nanosheets/δ-MnO2 composite by Varma et al. 2013. Graphene oxide nanoplatelets fabricated onto membrane bioreactor suppressed the fouling produced by waste water, fivefold times better than the chemical cleaning agents (Lee et al. 2013). Anatase coupled with graphene removes the contaminants present in wastewater (Aglietto 2010). AlO(OH)–chitosan composite loaded with silver nanoparticles are used in the development of water purifier at an affordable cost of US$2.5/year per family (Sankar et al. 2013). Moringa oleifera seeds have served as effective primary coagulants in water treatment by rural communities over the years (Dalen et al. 2009). The rural communities in India, Sudan, Malawi, Myanmar and Indonesia used the dried, powdered seeds of M. oleifera as a low-cost coagulant for reducing bacterial and viral contamination and also to remove turbidity from drinking water (Roloff et al. 2009). These seeds contain proteins which possess active coagulation properties (Olayemi and Alabi 1994; Sotheeswaran et al. 2011). The presence of benzyl isothiocyanate and benzyl glucosinolate in the seeds acts as prominent antibiotics and provides effective antimicrobial activity (Eilert et al. 1981). The seed protein is a natural polypeptide which helps in the sedimentation process and found to be non-toxic (Madsen et al. 1987). The polyelectrolyte (1 %) present in the seed possesses the capability to neutralize the formed charged colloid (Sapana et al. 2012). In our present work, we have bio-reduced graphene oxide using the aqueous extract of A. polygonoides and characterized the graphene by UV–Visible spectroscopy, XRD, FTIR, Zeta potential and TEM analysis. Subsequently graphene was further sonicated (3 g/20 ml ethanol) for 60 min and dried at 120 °C for obtaining few-layer graphene and to remove the unreacted ones. Thus the prepared graphene was used as adsorbent for the treatment of polluted water and different water quality parameters were analysed after treatment with the adsorbents. To enhance the antimicrobial activity of the synthesized graphene, graphene was decorated with silver nanoparticles. The non-toxic, anticoagulant properties of M. oleifera seeds and traditional knowledge of its uses as natural absorbent and eco-friendly antimicrobial agent for the purification of drinking water, prompted us to incorporate the seed powder for enhancing the properties of the prepared adsorbents. Hence graphene decorated with silver nanoparticles was further loaded with powdered M. oleifera. Graphite powder and Silver nitrate were purchased from SD fine chemicals, India. A. polygonoides was collected from a vegetable vendor in Coimbatore. The analytical grade chemicals used in this work (calcium sulphate, magnesium sulphate, calcium chloride, magnesium chloride, 1,5-diphenylcarbazide, sulphuric acid, Rhodamine dye, Eriochrome black dye, Crystal violet dye, potassium dichromate, cellulose, phenol, Folin–Ciocalteu’s phenol reagent and reducing sugar) were purchased from Merck chemicals, India. Fresh plant of Amaranthus polygonoides (20 g) was washed, blended and stirred continuously for 30 min at 50 °C. The mixture was filtered using Whatman filter paper and refrigerated at −4 °C. Graphene oxide was prepared by modified Hummer’s method (Ma et al. 2013; Ankamwar and Surti 2012). 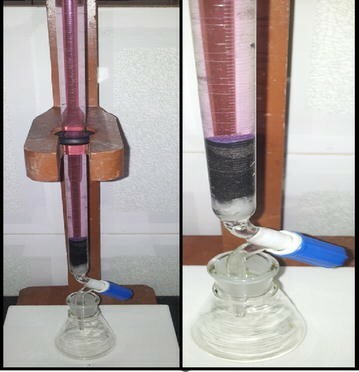 Graphite powder (2 g) was treated with concentrated sulphuric acid (46 mL) in ice-cold condition and stirred for 2 h. Potassium permanganate (6 g) was added in regular intervals of 30 min at 35 °C and the mixture was stirred continuously in an oil bath for 2 h at 50 °C. Doubly distilled water (92 mL) was added with vigorous stirring for 15 min till dark brown suspension was obtained. Hydrogen peroxide 30 % (280 mL) was added until the solution turned pale yellow. The solution was filtered with 10 % hydrochloric acid and finally with double-distilled water to obtain pure graphene oxide. Thus, the obtained graphene oxide was homogenized using an Ultrasonic homogenizer and dried in a vacuum. Stable graphene oxide was prepared by sonicating 60 mg of graphene oxide in 120 ml distilled water for 30 min. The aqueous extract of A. polygonoides (SK) (10 ml) was added to the stable graphene oxide solution and refluxed until the brown colour solution changes to black. The black solution was filtered using Whatman filter paper and dried. UV–visible spectrum and FTIR of nanoparticles were recorded using Double Beam Spectrophotometer—2202 (Systronics) and FTIR 8400S (Shimadzu), respectively. X’Pert Pro system with Cu Kα radiation (λ = 1.54060 A) operated at 45 kV and 30 mA over the range of 2θ = 10–70o at a scanning rate of 2/min was used for X-ray Diffraction (XRD) studies. Mass of graphene was recorded as a function of temperature in a SII-6300-TG–DTA (Exstar) Thermo gravimetric analyser under nitrogen flow. The zeta potential was analysed using NanoPartica SZ-100 series (Horiba) and maintained at a temperature of 25 °C for 2 min. The morphology of nanographene was examined using FEI’s Tecnai™ G2 Transmission Electron Microscope. Raman spectrum was obtained using R-3000 QE with an excitation wavelength of 785 nm and optical resolution of 6 cm−1. Scanning Electron Microscope (e-SEM, FEI Quanta 250) was used to examine the morphology of the reduced graphene oxide (SKRGO) coated on the carbon substrate. The spectra were recorded using MULTILAB 2000 Base system (Thermo Scientific) with X-ray, Auger and ISS attachments. Industrial effluents have a hodgepodge of organic and inorganic molecules. The primary aim of this research is to establish the efficacy of synthesized graphene in water treatment. The numerous ions and compounds in industrial effluents may interfere with the estimation procedures and hence it felt pertinent to prepare synthetic effluents. Synthetic effluents were prepared in the lab as per literature given below in order to avoid interference of ions present in the industrial effluents and also in the estimation procedure. Three synthetic effluents namely textile effluent, tannery effluent and paper mill effluent were prepared as per literature data. Synthetic textile effluent was prepared by adding calcium sulphate (130 mg/L), calcium chloride (312 mg/L), sodium bicarbonate (520 mg/L), magnesium sulphate (316 mg/L), crystal violet solution (5 mL) and Rhodamine dye (1 mg/L) (Ranganathan et al. 2006; Ramesh Babu et al. 2007). The tannery effluent was prepared by adding sodium carbonate (300 mg/L), calcium carbonate (300 mg/L), sodium bicarbonate (300 mg/L) and chromium (250 mg/L) (Mahimairaja et al. 2011; Jain et al. 2006; Sivakumar et al. 2010). Paper mill effluent was simulated with the composition: calcium sulphate (130 mg/L), cellulose (628 mg/L), glucose (186 mg/L), calcium chloride (312 mg/L), sodium bicarbonate (480 mg/L), magnesium sulphate (72 mg/L) and phenol (40 mg/L) (Suriyanarayanan et al. 2010). Five adsorbents were used in the study viz. (i) few-layer graphene (G) (ii) graphene decorated with silver nanoparticles (GA) (iii) commercially available activated charcoal (AC), graphene with M. oleifera seeds powder (GM) and (iv) graphene loaded with silver nanoparticles and powdered M. oleifera seeds (GAM). The adsorbent GA was prepared by sonicating the biosynthesized few-layer graphene (SKRGO) and graphene with silver nanoparticles (SK-AgNPs). The adsorbent GAM was prepared by mixing GA (150 mg) with the fine powder of M. oleifera seeds (150 mg). Similarly for GM adsorbent but instead of GA, graphene (G) was incorporated. The slurry of five adsorbents (each 300 mg) was prepared by mixing few-layer graphene (G), graphene fabricated with silver nanoparticles (GA), activated carbon (AC) with 100 mg of silica gel. Glass columns of height 30 cm and internal diameter 1.5 cm was set identically with four adsorbents. The effluent feed to the column was fixed as 10 ml and the flow rate was maintained at 10 ml/15 min. A total quantity of about 100 ml of each effluent was treated with the four adsorbents. The reusability of the adsorbents was analysed using the same fixed bed column for the three different industrial effluents after continuous washing with deionized water and thermal activation at 70–80 °C for 6 h. The water quality parameters before and after flow through the glass columns were estimated to analyse the potency of the adsorbents. The percentage of adsorption was calculated using the formula. The physicochemical characteristics of effluents and the water obtained after treatment with the adsorbents were determined using standard methods of APHA (2002). The water quality of effluents before and after treatment was tested by various parameters like colour, odour, pH, conductivity (20 mS) (conductivity metre), absorbance (540 nm) and transmittance (%) (Photocolorimeter). The total hardness (mg/mL) of the three effluents before and after the treatment was estimated by EDTA titration method according to standard method. Chromium was determined by the colorimetric method by diphenylcarbazide method (Adeel et al. 2012). Ten millilitre of the tannery effluent sample before and after treatment (pH between 7.5–8.0) was mixed with 1 mL 1,5-diphenylcarbazide solution and 1 mL sulphuric acid solution and diluted up to 50 mL with distilled water. After 15 min, spectrophotometer readings were taken at 540 nm wavelengths against potassium chromate as standard. Total phenolic content (TP) was measured in triplicate using the Folin–Ciocalteu’s phenol reagent, involving the addition of 200 μL Folin–Ciocalteu’s phenol reagent to 3.6 mL diluted sample. After 3 min, 800 μL of sodium carbonate (200 g/L) was added. The mixture was kept for 5 min. The Prussian blue colour developed on the addition of Folin–Ciocalteu reagent to the samples. The solution was diluted with 20 mL of deionised water. The absorbance was measured at 540 nm using photocolorimeter by the procedure of Catalano et al. (1999) and Singleton et al. (1999). The untreated and treated effluents were analysed using UV–Visible spectroscopy to determine the intensity of the chromophoric groups in the samples. The physicochemical characteristics of textile effluent and the water obtained after treatment with the adsorbents were submitted to SITRA (South Indian Textiles Research Association) laboratory, service for the excellence certified institution for further certification of water quality parameters. Graphene oxide bio-reduction with aqueous extract of A. polygonoides produced a visible colour change of the reaction mixture from brown to black after 7 h refluxing. The black colour solution revealed the removal of oxygen bonds and restoration of electronic conjugation of π network. The absorption spectra of graphene oxide and few-layer graphene (SKRGO) are shown in Fig. 1. The absorption band at 270 nm corresponds to the deoxygenation and complete reduction of graphene oxide. The concentration of few-layer graphene and graphene oxide to form a stable dispersed solution may significantly manipulate the absorption bands obtained in UV–Visible spectroscopy. The obtained results were similar to that of the reduction of graphene oxide using L-ascorbic acid (Fernández-Merino et al. 2010) and l-cysteine (Chen et al. 2011). The occurrence of red shift has been used as a monitoring tool for the reduction of graphene oxide. Figure 2 represents the XRD patterns of the graphene oxide and reduced graphene (SKRGO). The diffraction peak of graphene oxide (002) at 2θ = 10.51º with d-spacing of 0.84 nm indicates the formation of oxygen-containing functional groups between the layers. The XRD patterns of SKRGO revealed the disappearance of the (002) reflection peak with a broad peak at 2θ = 26.5º (d-spacing = 0.33 nm) which is different from that of pristine graphite. This suggests the complete reduction of graphene oxide by phytoextract and formation of few-layer graphene. The particle size of the synthesized graphene (SKRGO) is 369 nm (Fig. 3). The zeta potential measurement of reduced graphene oxide is −48.5 mV indicates the formation of anionic-charged particles (Fig. 4). Graphene possessing positive surface charge absorbs anions, whereas negative surface charge will have the benefits of absorbing cations (Meo 2013). Li et al. (2013) reported that the presence of surface negative charge on graphene materials attracts the positively charged Cu2+. The zeta potential values less than −30 mv indicates strong repulsive forces. The zeta potential results of biosynthesized graphene (SKRGO) revealed the presence of negative surface charge which can absorb cations, its stability and water insoluble property may find application in the removal of heavy metal ions. Hence, SKRGO can be used as an adsorbent in the treatment of effluents. The Raman shift of biosynthesized graphene (SKRGO) shows D band at 1359 cm−1 and G band at 1591 cm−1 which reveal the presence of few-layer graphene (Fig. 5). The complete loss of 2D peak (~2670 cm−1) accompanied by peak broadening and 20–30 cm−1 shift of G band suggests that the graphene flakes are composed of 5–20 layers (Chabot et al. 2013). The variations in the relative intensities of the G peak and D peak in the Raman spectra of biosynthesized graphene indicate a change in the electronic conjugation state. The structure of reduced graphene oxide (SKRGO) was further confirmed by X-ray photoelectron spectroscopy (XPS), a surface-sensitive analytical technique useful to determine the chemical environment of atoms. The oxygen content of RGO mostly expressed as carbon to oxygen ratio (C/O) is a widely accepted criterion for evaluation of the reduction process. XPS spectra show the presence of C1 s and O1 s (Fig. 6) which is on par with that of previous literature (Abdolhosseinzadeh et al. 2015). The C/O ratio in the XPS spectra of SKRGO revealed a successful reduction process (Fig. 6). 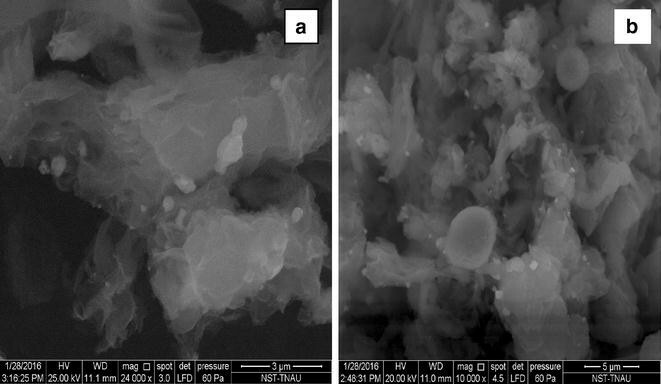 The SEM images and its EDAX spectrum of the adsorbent (GAM) before and after treatment with textile effluent are shown in Figs. 7, 8. The formation of few-layer graphene (SKRGO) was confirmed by SEM images (Fig. 8). The EDAX spectrum clearly showed the presence of silver nanoparticles before and after treatment with textile effluent (Fig. 7). 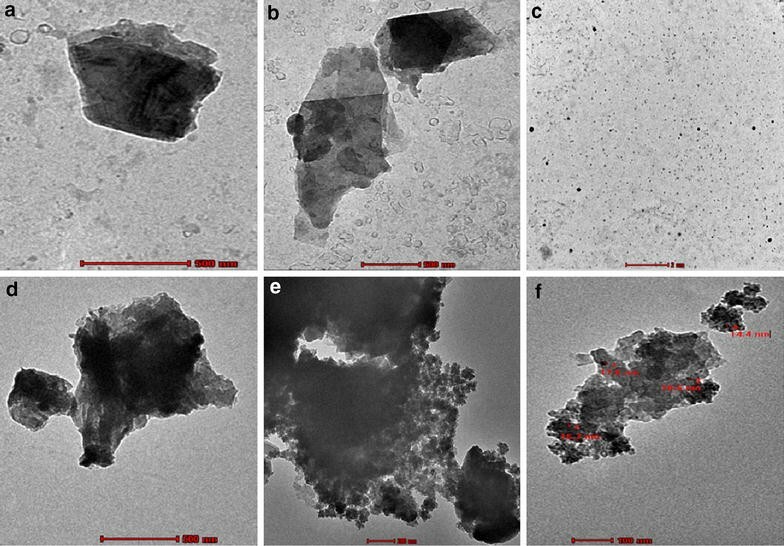 Thus the results revealed that the silver nanoparticles still remained in the graphene and adsorption of other elements onto the adsorbent surface. The EDAX measurements of the synthesized adsorbent (GA) confirms the reduction of graphene oxide using the extract of Amaranthus polygonoides as seen from the significant reduction of oxygen content (20 atom %) and decreased C/O ratio (Fig. 7) compared to that of graphene oxide reported (Firdhouse and Lalitha 2013). The TEM images of the synthesized graphene (SKRGO) (Figs. 9a, b), silver nanoparticles (Fig. 9c) and SKRGO loaded with silver nanoparticles (GA) (Figs. 9d, e, f) reveal the formation of few-layer graphene using the aqueous extract of A. polygonoides. The monodispersed spherical shaped biosynthesized silver nanoparticles using the same plant extract is shown in Fig. 9c. The graphene decorated with silver nanoparticles is clearly depicted in Figs. 9d, e and the monodispersed spherical shaped silver nanoparticles (10–20 nm) is labelled in Fig. 9f. Betalamic acid is the main constituent of A. cruentus, A. blitum, A. dubius and A. tricolour. Betalains a structurally related chromoalkaloid has betalamic acid as the chromophore (Biswas et al. 2013). From the aforesaid reports on plants of genus Amaranthus, it is proposed that the metabolite betalamic acid could be the molecule responsible for the reduction of graphene oxide. The probable mechanism of reduction by betalamic acid is given below (Scheme 1) as evidenced from the presence of alkaloids in A. polygonoides extract. The presence of N1s in the XPS spectra (Fig. 6) reveals that the nitrogen in betalamic acid may be accountable for the reduction of graphene oxide to graphene. A preliminary study was conducted to find out the efficacy of the four adsorbents viz. G, GA, GAM, GM and AC in the treatment of three synthetic effluent samples—textile, tannery and paper mill and its results were discussed. The absorbance of the effluent samples before and after treatment with the four adsorbents is given in Table 1. The absorbance results reveal that all four adsorbents used for treating textile effluent showed better results compared to that of paper mill and tannery effluents. Initially, rapid adsorption occurs which may be due to the large number of available sites on the adsorbents in the initial stage. As time proceeds, the concentration gradients gradually reduced the deposition or adsorption of salts on the surface sites of GA and GAM, leading to the decrease in the adsorption rate at the later stage. Thus, it decreases the adsorption capability of GA and GAM when treated with other (paper mill and tannery) effluents. The adsorption efficacy of the adsorbents was calculated from the absorbance values of the effluents obtained before and after treatment with four absorbents with textile, tannery and paper mill effluents (Table 1). The results of percentage adsorption obtained for the four adsorbents show greater efficiency for textile and tannery effluents than paper mill effluent. The percentage adsorption was 98, 92, 94, 84 and 81 % for GAM, GA, AC, G and GM, respectively, when used for treatment with textile effluent samples. In the case of treated tannery effluent samples above 50 % percentage adsorption was obtained for all the three adsorbents. Nearly 30 % percentage adsorption potential for all three adsorbents was observed when used for treating paper mill effluent (Table 2). The results of the percentage adsorption obtained for four different adsorbents (G, GA, GAM, GM and AC) reveals that the GAM possesses good adsorbent efficacy than the other adsorbents. This may be due to the presence of organic moieties in the textile effluent which get adsorbed easily onto the surface of the adsorbents. Hence, the difference in sorption behaviour may be associated with the distributed species under the experimental conditions and also the interaction of the species onto the surface of the selected adsorbents. Hence, textile effluent sample was taken for further studies. Based on the results of percentage adsorption, textile effluent sample was treated with GAM adsorbent and the physicochemical parameters were analysed for the treated sample. The control size of AgNPs on the surface of few-layer graphene offers a possible strategy for further improving the adsorption performance of the prepared composite (GA). In addition to this, the coagulation property of M. oleifera in GAM enhances the adsorption efficacy than GA. Hence, GAM adsorbents were chosen particularly for the treatment of textile effluent and the quality of water sample collected after treatment of synthetic textile effluent was validated in the laboratory of SITRA (South Indian Textile Research Association), a certified laboratory for testing water quality. Figure 10 is the photograph of columns packed with GAM for treating the synthetic textile effluent. The water collected after treatment with the GAM adsorbent was analysed for water quality parameters according to the standard methods (APHA 2002; Booth (1983)) and the results are given in Table 3. The results are compared with various water quality standards prescribed by Indian Standard Institute (ISI) (Indian Standard 1991). The absorbance of the textile effluent before treatment with adsorbents, analysed by UV–Visible spectroscopy (Fig. 11) reveals two bands at 330 and 560 nm indicating the presence of chromophoric groups. The effluent after treatment with adsorbent (GA) shows only one band at 560 nm and the intensity of this band is less compared to the band obtained for textile effluent sample. Lesser absorption bands indicate less UV active chemical components. Obviously the two bands present in the textile effluent sample was found to absent in the sample after treatment with the GAM and AC adsorbents (Fig. 11). Hence, it was observed that graphene loaded with silver nanoparticles and M. oleifera seed powder (GAM) showed better results compared to activated charcoal (AC) and greater efficiency than graphene loaded with silver nanoparticle (GA) adsorbent. The physicochemical characteristics of textile effluent and the water sample obtained after treatment with GA and GAM adsorbents are given in Table 3. The intensity of the effluent colour decreased to 7 and 17 from 158 after treating the textile effluent with GA and GAM adsorbents, respectively. No characteristic odour was observed for the water samples collected after treatment with GA and GAM adsorbents. The turbidity present in the effluent was found to be less in the treated sample indicating the deposition of organic moieties onto the adsorbents. Due to the adsorption of organic salts the total hardness of the treated textile effluent decreased by 30 % entailing the adsorbent efficacy of GA and GAM. The BOD and COD values of the textile effluent (1334 and 3625 mg/L, respectively) reduced to 407 and 897 mg/L respectively, after treating with GA adsorbent. The BOD and COD values decreased to 79 and 274 mg/L, respectively with GAM adsorbent. The chloride content reduced to 550 and 170 mg/L from 700 mg/L for the sample treated with GA and GAM adsorbents, respectively. The total dissolved solids also diminished to 2130 and 560 mg/L from 2270 mg/L for GA and GAM treated sample revealing the appreciable adsorption potential of GAM. The above results portray the good adsorption potential of GAM. The adsorbent can treat water efficiently by retaining the original properties of normal tap water. Nanosilver-decorated graphene material owns the adsorption characteristics of AgNPs and the extraordinary properties of graphene, such as a large surface area, and antimicrobial activity of AgNPs and coagulation property of protein present in the seeds of M. oleifera. These results indicate that GAM adsorbent is suitable for the treatment of both industrial wastewater and ground water. The higher adsorption is due to protonation on the surface of the adsorbent. This may be due to the planar sheet structure and high surface area of graphene may be responsible for stronger protonation of the functional groups present in the effluent on the surface of adsorbent. Similar observation is reported by earlier worker (Yusuf et al. 2015). The positive charge on the carbon surface is due to the presence of basic surface groups, the excessive protonation of the carbon surface at low pH values, to graphene layers that act as Lewis bases. These Lewis bases result in the formation of acceptor–donor complexes important for the absorption of many organic compounds. At higher pH values, the carbon surface has a negative charge due to the ionization of acidic-carbon–oxygen surface groups. The adsorption of metals mainly involves electrostatic interaction between the positively charged metal ionic species present in the solution and the negative sites created by the ionization of the acidic-carbon–oxygen surface groups involving ion-exchange mechanism (Tascón 2012). Active sand supported with sugar-derived graphenic material made through green methods show better adsorption capacity for Rhodamine 6G dye and Chlorpyrifos pesticide (Gupta et al. 2012). The overall adsorption process may be controlled by either one or more steps, including outer diffusion, intra-particle diffusion and adsorption of the adsorbates onto active sites (Rengaraj et al. 2004). Activated carbon can be produced using either physical or chemical processes ([9, 12]). In the physical process, high temperatures (700–800 °C) are maintained to remove the non-carbon species and to increase the porosity it undergoes an activation process. Compounds like H3PO4 or ZnCl2 are used in the chemical process. This results in charring and aromatization of the carbon skeleton and creation of the porous structure (Dabrowski et al. 2005). Activated carbon is not efficient for disinfection and nitrate removal (Streat et al. 1995). If these contaminants have low adsorb ability, the powdered form may be more costly and may generate sludge disposal problems (Moreno-Castilla et al. 1995). These shortcomings can be overcome by graphene-modified adsorbents. Functionalized nano-sized graphene has been used as a drug carrier for in vitro intracellular delivery of anticancer chemotherapy drugs (Sun et al. 2008). It has been found that nanographene with a biocompatible polyethylene glycol (PEG) coating exhibited high passive in vivo tumour uptake and could be used for effective photothermal ablation of tumours in a mouse model (Liu et al. 2008). Aromatic anticancer drugs (e.g. SN38 and Doxorubicin) were effectively loaded on the graphene surface via π-π stacking for intracellular drug delivery (Zhang et al. 2010; Yang et al. 2008). Ultra-high drug loading efficiency was achieved owing to the extremely large surface area of graphene, which has every atom exposed on its surface (Markovic et al. 2010). Hence the nanographene are biocompatible and non-toxic. Therefore, the adsorbents follow multiple mechanisms during adsorption, including electrostatic attraction and surface complexation, which causes the occurrence of multilayer sorption. For practical applications, further studies such as economic evaluation, continuous flow adsorption and field experiments are warranted. The results of the study reveal GAM to exhibit good adsorption potential. This may be due to the composition of GAM adsorbent which is endorsed by the surface area, antimicrobial and adsorption potential of graphene and silver nanoparticles. Thus the composite prepared in the present work is a very low-cost adsorbent with ease of preparation and also eco-friendly. Hence it is a promising adsorbent in water treatment. The bio-reduction of graphene oxide using the aqueous extract of A. polygonoides was achieved and confirmed by UV–Visible spectroscopy XRD and XPS analysis. The formation of few layers of graphene with anionic-charged particles was analysed by SEM, TEM and zeta potential analysis, respectively. The enhancement of the adsorption potential of graphene was done by the fabrication of biosynthesized silver nanoparticles. The post adsorption analysis of the adsorbents (G, GA, GAM, GM and AC) evidently revealed that the graphene loaded with silver nanoparticles and seed powder of M. oleifera composite (GAM) showed superior results compared to conventional adsorbents. This may be due to the composition of GAM adsorbent which is endorsed by the surface area, antimicrobial and adsorption potential of graphene and silver nanoparticles, in addition to the coagulation property of protein present in the seeds of M. oleifera. Thus the composite prepared in the present work is a very low-cost adsorbent with ease of preparation, eco-friendly and is a promising adsorbent in water treatment. FMJ carried out the preparation and characterization of the adsorbents and adsorption experiments. LP designed the whole study and both prepared the manuscript. Both authors read and approved the final manuscript. The authors sincerely thank the Avinashilingam Institute for Home Science and Higher Education for Women University, Coimbatore, Tamil Nadu, for providing research facilities; Department of Physics, of our University for recording XRD and Tamil Nadu Agricultural University, Coimbatore for recording SEM and SITRA, Coimbatore for their help rendered in the water quality analysis. Evans AEV, Hanjra MA, Jiang Y, Qadir M, Drechsel P (2012) Water pollution in Asia: The urgent need for prevention and monitoring, http://www.globalwaterforum.org/2012/06/09/water-pollution-in-asia-the..